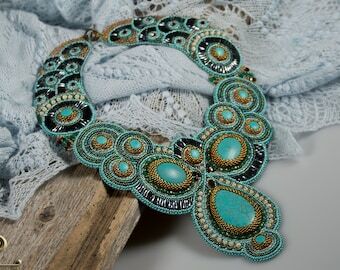 Announcement Bead embroidered jewelry, beaded jewelry, micro-macrame jewelry and Tree of Life amulets. Bead embroidered jewelry, beaded jewelry, micro-macrame jewelry and Tree of Life amulets. Pendant with natural Sea Urchin and tiger eye crystal. 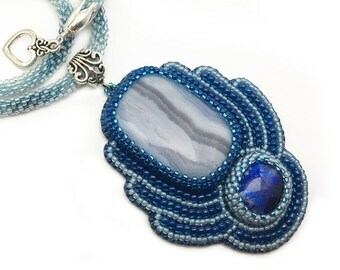 Bead embroidered pendant. 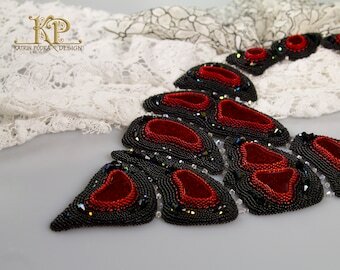 Bead embroidered brooch with natural bloodstone crystal. 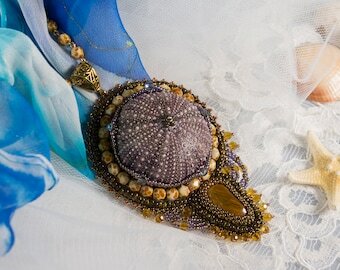 Bead embroidered brooch with natural carzy lace agate. 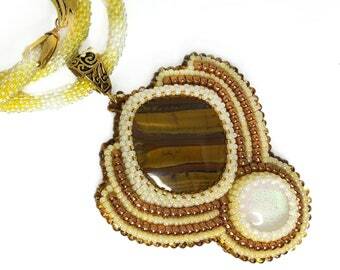 Beaded pendant with natural agate healing crystal. 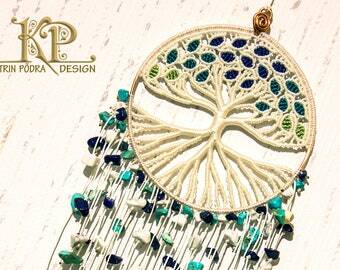 The dreamcatcher is not only visually beautiful, also the workmanship is very good. At this point: Compliments to the artist! This was made for my daughter and she loves it! Katrin created it quickly and shipped it on time! 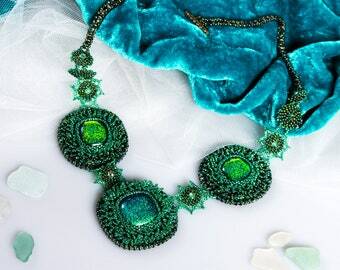 A beautiful necklace my daughter will wear often! New Tree of Life jewelry set is on the work table. Some green colors on the work table. Work in progress. 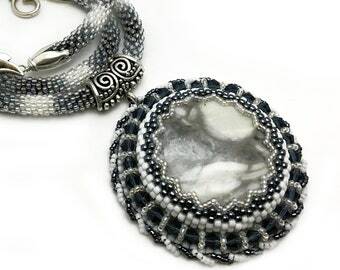 A shibori bracelet. Bead embroidered jewelry, beaded jewelry, micro macrame jewelry and Tree of Life amulets. Refunds for defective items are done after the item has returned. Refunds for packages lost in the mail are done after tracking, this may take some days, local postal service has to look into it and sometimes it takes a few days to even get a reply. If you have complaints, please send them in one week. About lost packages, so far *fingers crossed* it has been the matter of a lost notice slip from the local postal office, so one way of checking about the location of the package, is calling your local postal office and asking if they got anything there for you. Please be patient about the shipping time, especially from Europe to USA, it can take several weeks. Especially around holidays when the customs offices are busy. 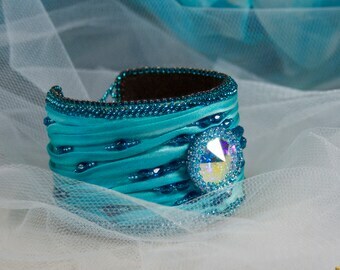 I accept Paypal, credit and debit cards, Etsy gift cards and other international payment methods where available. Local buyers from Estonia can also pay by bank transfer. Premade items usually ship out within 1...3 work days. Orders are shipped by registered letters with tracking. Tracking works with NO online checking option. If your registered letter does not arrive within 1 month, search inquiry will be sent out. No refunds are issued before mail provider has confirmed the status of delivery. We are not responsible for delays due to customs. If you want to get your order with online tracking, then contact us before ordering, as we need to send your order with registered package then and shipping price depends on size (not only weight) and costs more. Items ship from North Europe. Post travels to further countries like USA, Canada, Australia in 3–4 weeks, most common is 15 business days. Around Europe it usually takes 7..10 business days. To Japan the post is pretty fast, 5 business days or so. Time depends on the local postal service also. Be sure to get your package from your local postal office in time or it will be sent back (they keep registered packages about one week and if noone picks it up, the postal office will send the package back to the sender and for some reason, that takes one million years). Packages are never shipped before payment has cleared. If there is a problem with shipping - please let me know, and I do my best to advise you to track down the package. Customs duties and taxes are the buyer's responsibility. Please check your countries custom regulations before placing your order.